We’ve already discussed Lumia 720 and 103, so now it is time to check out yet another mobile phone that Nokia launched at its Mobile World Congress press briefing yesterday – the new Nokia 301. Despite being a Series 40-based feature phone, there are quite a number of notable functionality on the new Nokia 301 especially in terms of photography. Equipped with a 3.2-megapixels camera (no flash though), it comes with panorama mode and sequential shots up to 5 photos. Additionally, there is also a self-portrait mode that uses voice to help users snap a photo of themselves easily. That’s not all – since the Nokia 301 supports up to 3.5G HSPA connection, the device is pre-installed with several social apps such as WhatsApp, Facebook, Twitter and eBuddy. The feature phone also comes with Mail for Exchange, Nokia Xpress Browser and Nokia Slam technology. 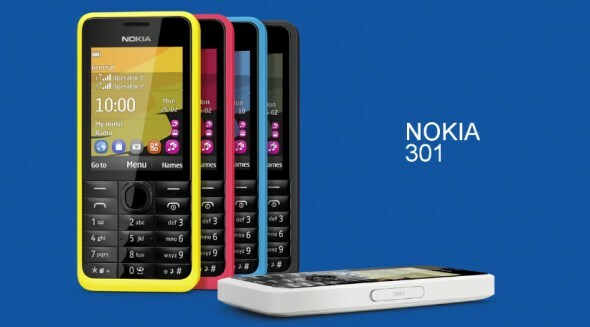 Available in single and dual-SIM configurations, the new Nokia 301 is heading to more than 120 countries across the globe starting from the second quarter of 2013 with a price tag of RM 264 (EUR 69).